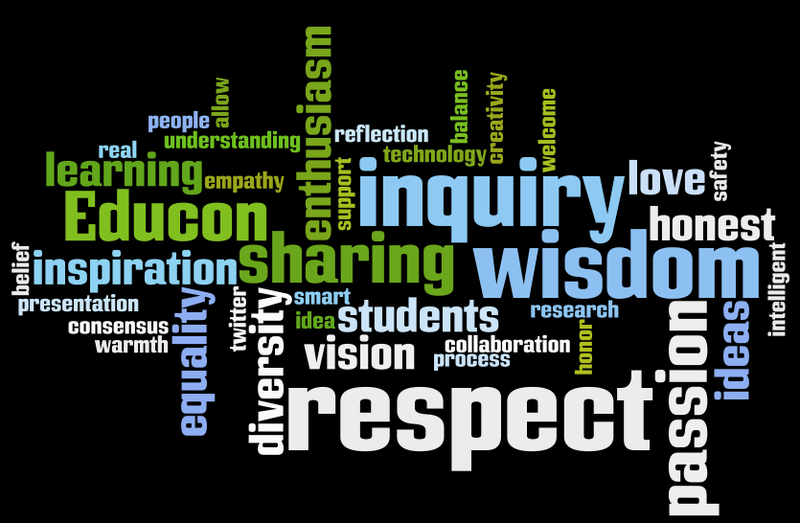 These words are my attempt at describing Educon, the Science Leadership Academy, and all those who shared their time, vision, and voice, especially the students. Attending this conference was my first experience at being physically surrounded by over 500 people who shared my beliefs about education. To say the least, it was exhilarating. The energy and enthusiasm, yes enthusiasm, about the potential for the direction of education was contagious. Yes, all of us were very aware of our situational constraints and they came up in many discussions, however it was not the place for bashing. Our concentration centered on vision, possibilities and how the collective “we” can provide for real, authentic learning experiences and communities of care. The Science Leadership Academy itself was awe-inspiring. Is it impeccably furnished and maintained? No. Is it outfitted wih the latest and greatest technological and scientific instruments for learning? No. Are there elaborate performance or presentation areas? No. Are students all about academics and drive? No. Actually, from an unknowing eye SLA may appear to be “rough around the edges”. I hope I’m not putting my foot in my mouth by saying that its not perfect appearance, fits this school perfectly. Perfectionism is not something that’s highly regarded here. Nobody is perfect, the world is imperfect, and SLA is about real life, real world learning. SLA is proud to be a “community of care”. Teachers are student advisors; they offer continual support in all facets of student life. This is a democratized learning environment, where teachers are co-learners and questions and ideas are encouraged and honored. SLA’s focus on inquiry, research, collaboration, presentation and reflection, fosters and reflects real world, life long learning. The students at SLA are welcoming, intelligent, passionate, supportive, enthusiastic, fun loving and unbelievably wisdom filled. They are proud of their school. They have a voice here and they love to share their thoughts, views and passions. These kids are a product of this learning environment; it works. They are respected and in return they respect. One might argue that these kids are the cream of the crop and that’s why it works as well as it does. I say, prove it! Copy this model and see what happens. I can’t wait to see the results.